VIIG d.o.o. is a company which has been marketing and making metal products for as long as 30 years. We are specialised in the production of compressor casings and forestry equipment. 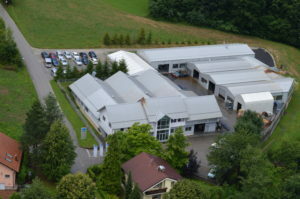 As a medium-sized company, we unite professional knowledge of the employees, capacities of high technology, informatics supported machinery, flexibility for an individual approach to customers, and an openness to novelties, as well as accepting challenges and fulfilling the requests of our customers. Satisfied customers are our constant mission. They receive qualitative products or services from us in an agreed upon time and for the agreed upon price. We can boast a series of important and demanding industrial clients, who return to us with their orders. We ensure the quality of the operation of our company in all fields of our work. Through and constant following of financial and non-financial business indicators is one of the most important tasks in the management of our company. It enables us to understand past business decisions and make future ones, as well as form a strategy of operation, compatible with our vision and mission. The quality level of our products and services is achieved primarily with a high quality of work and thorough quality control in the processes of realisation, while an important role is also played by investments into technology and its regular maintenance. In 2016, we also acquired the ISO certification. At the company VIIG, we, as a team, believe that long-term successful operation is only possible with a policy of established transparent operation, constant improvements of our activities, challenge accepting and risk management, as well as adaptation to the requests of our customers. These rules of operation reflect our adopted policies and activities for a successful business, while the employees are obligated to use them, along with other documents, as a set of instructions in their work. The company VIIG is a family company which began its activities in 1992. It stems from the craftsmanship of the metalworks of Marjan Vintar, whose beginnings reach all the way into 1978. Through the years, the company grew and expanded from its humble beginnings of mechanical processing. Domestic customers were joined by demanding foreign ones, and the number of employees reached 40. In Europe, we are one of the most recognized manufacturers of winches, pulleys and compressor housings. For our customers, we also manufacture various metal components and offer services in the field of laser cutting, punching, bending, milling, turning, welding and painting. We wish to further reinforce our position as a high-quality, acknowledged supplier, both locally and in the global market. We wish to offer our ever more demanding customers comprehensive solutions with a high level of added value and constantly meet their demands for quality and timely delivery.